I’d like to thank Knorr for sponsoring my Rice, Black Beans and Corn Stuffed Sweet Potatoes recipe. 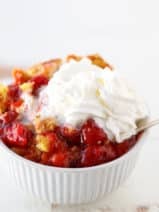 As much as I love the holidays, including those big holiday meals, I reach a point in late December when I just want to eat something different. 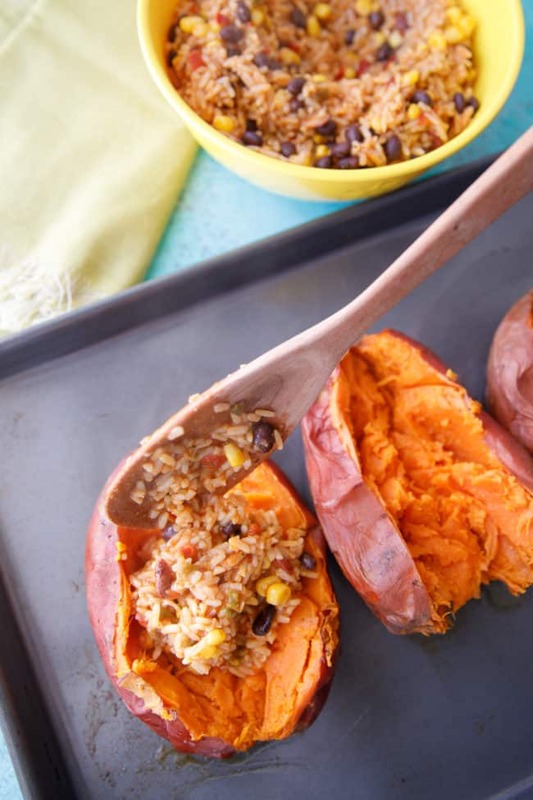 That craving for something different is what inspired me to create these delicious rice, black beans and corn stuffed sweet potatoes. Oh, and I made these in a snap with a little help from Knorr Selects Rustic Mexican Rice and Beans! 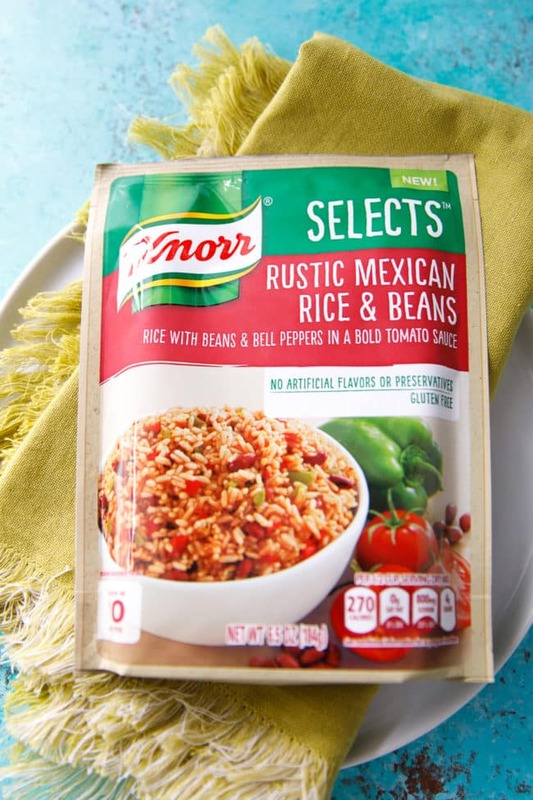 Of all the Knorr Selects flavors, the Rustic Mexican Rice and Beans is my favorite. 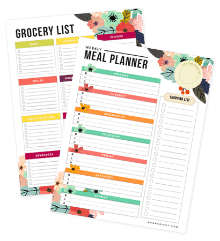 It’s really wonderful on its own, but I’ve loved creating delicious family meals using this scrumptious product. 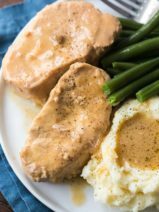 I continue to reach for Knorr Selects when I’m planning my family’s meals because it’s yummy and simple to prepare. I also love that it has no artificial flavors or preservatives. 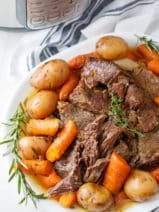 I love that Knorr Selects inspires me to create easy family meals that I can put together in a pinch that are full of flavor. 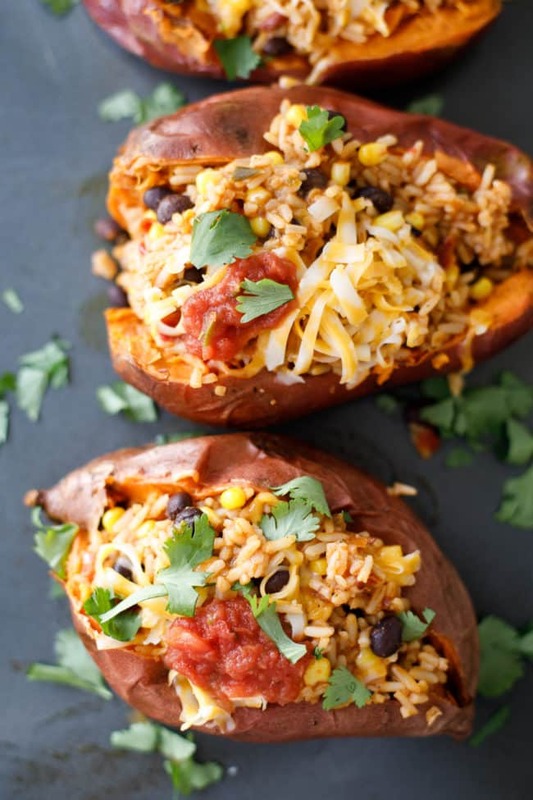 I just recently realized how much I adore stuffed sweet potatoes. 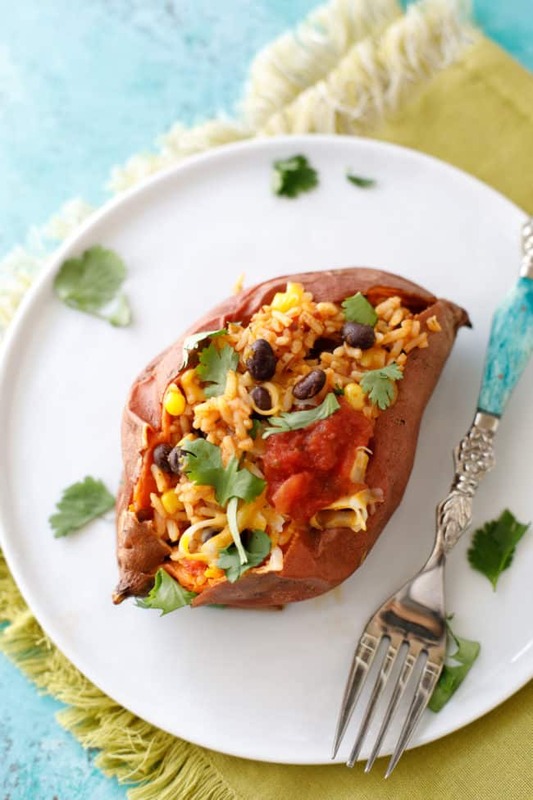 There are a variety of ingredients that you can use to create a savory stuffed sweet potato, and I love this combination of rice, sweet corn and black beans. 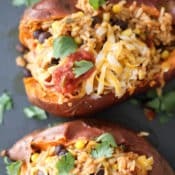 Top each sweet potato with some salsa, cheese and a little fresh cilantro and you’ll have a tasty and better-for-you meal that’s loaded with flavor. This recipe offers a great way for you to get creative on taco Tuesday! 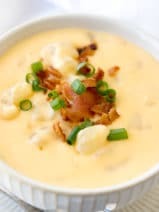 Add some tortilla chips to your plate for a little crunch to make this dish even more special. I hope you have a wonderful holiday, a happy new year, and that you love these tasty stuffed sweet potatoes as much as I do! Scrub 4-6 sweet potatoes. Poke holes in them with a fork, then brush with olive oil and wrap each potato in foil, individually. Place potatoes on a baking sheet and bake for about 45 minutes. When baking is completed, turn off the oven and let the potatoes remain in the oven for an additional 10 minutes. During this final 10 minutes, prepare Knorr Selects Rustic Mexican Rice & Beans per the package instructions. When there are a few minutes left in the cook time, add 1 tsp cumin, 1 cup frozen corn and 1 cup black beans to the mixture. Stir and continue the cook time. Using a knife, slice the top of each potato and spoon the rice mixture into the cavity. Top with shredded cheese, fresh cilantro and fresh salsa. Serve warm and enjoy! 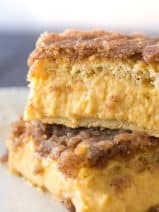 i love sweet potatoes because they are great for keto diets. 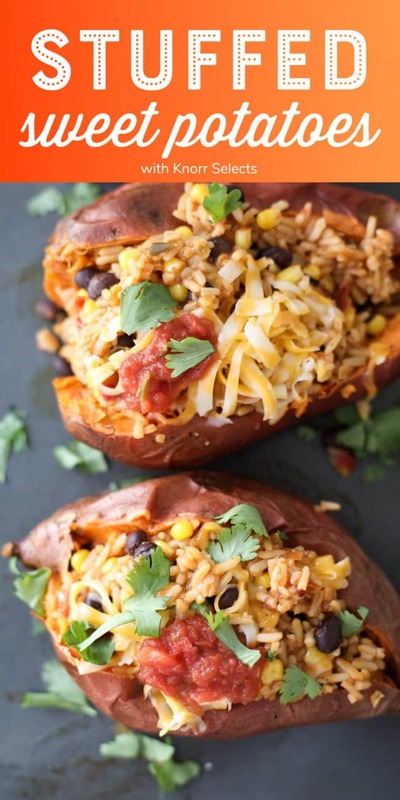 i will have to try this out soon because stuffed sweet potatoes are yummy.